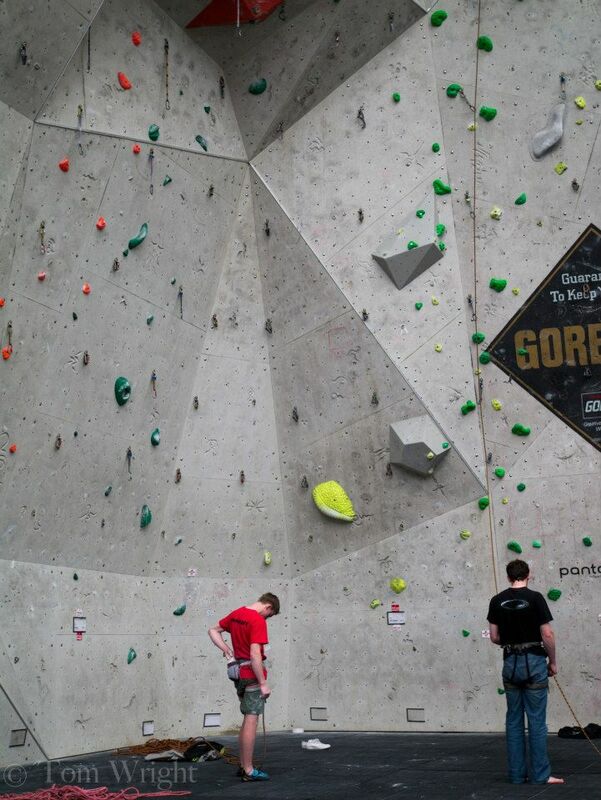 After winning three regional rounds of the BMC Youth Climbing Series in the South West it was time to go and compete in the national finals at EICA in Ratho, Edinburgh. After several weeks of relatively little climbing and not much training I soon realised that I only had one week left until the final. For my final session three days prior to the final I trained at Undercover Rock with Charlotte for some onsight practice and managed to drop most routes that I tried… I attempted to flash the Girls Youth A final route from the third regional round but still fell lower than many of the girls did. This left me feeling rather worried about my performance and doubted any chances of doing well in a couple of days at the final. Before I knew it it was Friday and I travelled up to Edinburgh still with a huge amount of uncertainty that I would have any chance of success the following day. Later arriving at the hotel feeling rather relaxed and now felt little pressure with my expectations being fairly low. We had dinner then went to bed quite late (ooops!). Waking up the next morning I thought the late night was a bit of a mistake which lowered my expectations even further and relieved more pressure. We arrived at the wall and I had a quick look at my routes and still felt completely relaxed (which is very unusual for me at this point). After a short warm up I got on my first route and topped it with little trouble, then onto my first boulder which I flashed, then the second boulder… On my first attempt I pulled on and my foot popped causing me to dab. Second go and I did the crux, then forgot where to put my feet and then was off there again, still with no top. Third attempt and I moved through all of it easily and topped it. We then moved onto the second route which I also topped fairly easily and so did most of the majority of the other competitors. 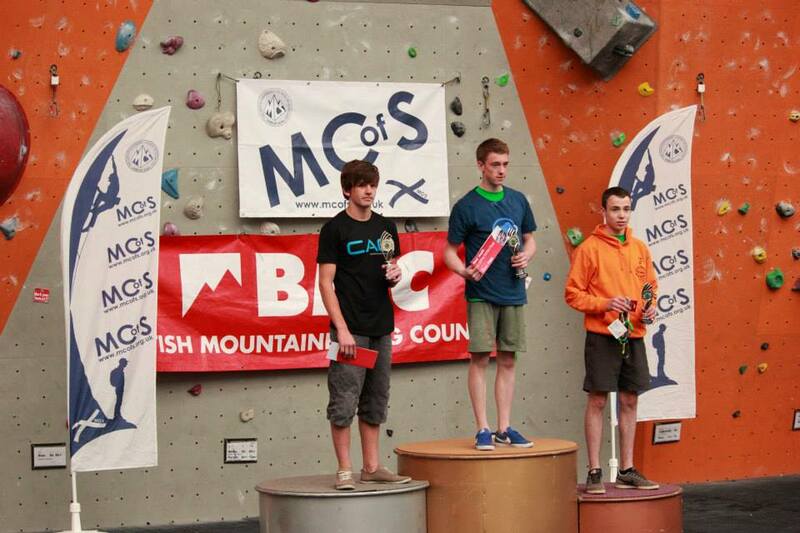 With only one route and one boulder left it was all to play for with around 10 of us in joint first place. We all gathered around our third boulder problem and I watched several people flash the problem before it came to me where I dropped it. Second go and again I fell in the same place. Shortly afterwards it was back to me and I believed that topping this boulder would be the difference between finishing with a reasonable result or just being very disappointed with my final position in my last year of competing in the Youth Climbing Series… I fell off on the same move. All I had left now was my final route. I didn’t take too much notice of how other climbers were doing on the final route and just did a few routes on the new comp wall to stay warm whilst others got on the route. Soon came my turn and I got on the route feeling completely calm and relaxed. I quickly moved through the bottom section almost dropping it in a couple of places and before I knew it I was very close to topping the route and I wasn’t feeling too pumped. I moved into the final section and was faced with roughly 3 meters of climbing before the top. 2 meters left and I realised that I had missed a clip meaning I had to now hang a poor crimp to make a difficult clip below… I managed to make the clip and now just had three more moves to top it. Gaston, gaston and throw for the top hold. I held the first of the gastons, then the second and now had to make a big move to get the final hold and potentially take the win. I went for the move with a poor amount of commitment and the tough move spat me off and I was out of there! I couldn’t believe it, so close to topping it! I got lowered to the ground and felt quite disappointed with myself. Soon afterwards I was told that I had set the highpoint and there were only two people left to try the route. Although they were both strong and I felt a huge rush of anxiety as I waited… I didn’t spend too much time watching the other competitors but still believed that I was nowhere near podium due to my poor effort on the boulders. After around 20 minutes of waiting the South West Team Co-ordinator screamed and congratulated me… on winning. Even after that I was still uncertain about whether I had won or not and headed over to the scoreboard to confirm my result. After another long wait Youth A Boys results came up and there I was in the top spot! I had done it; finally I had achieved a decent result in a competition. It all came as a bit of a surprise as for the past month or two I had felt on very bad form and hadn’t ticked anything outdoors and felt fairly weak indoors too. So it was nice to win even considering my poor performance and hope to be feeling on form in future comps. Dartrock Youth Climbing team members Tom Wright (Youth A) and Abe Semple (Youth D) also put in good efforts and achieved 7th and 19th. Charlotte came 4th narrowly missing out on 3rd with one point making the difference. The South West Team came second overall with everybody working hard and achieving great results in their individual categories. Pleased with my result I later headed out for food with some other members of the SW Team and felt the psyche to get straight back on the training and get back on form for future competitions. I’d also like to thank Dartrock Climbing Centre and Cat Wright in particular for all the support you’ve given the youth team over the past year, we all really appreciate all the hard work.